I went out to George’s house last August. His home is filled with posters documenting a remarkable history in jazz. 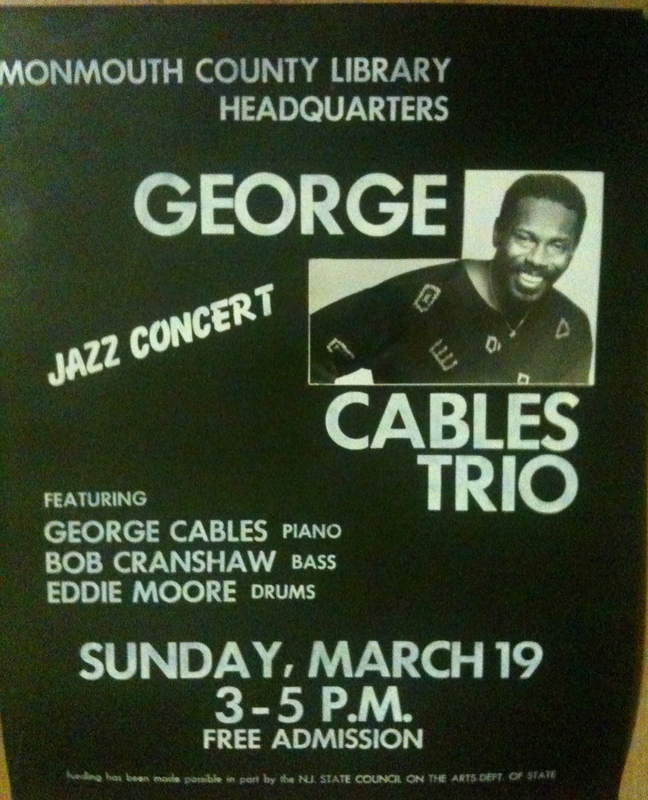 While George is perhaps best known as a sideman, he has an extensive list of distinctive compositions and is also marvelous trio pianist. 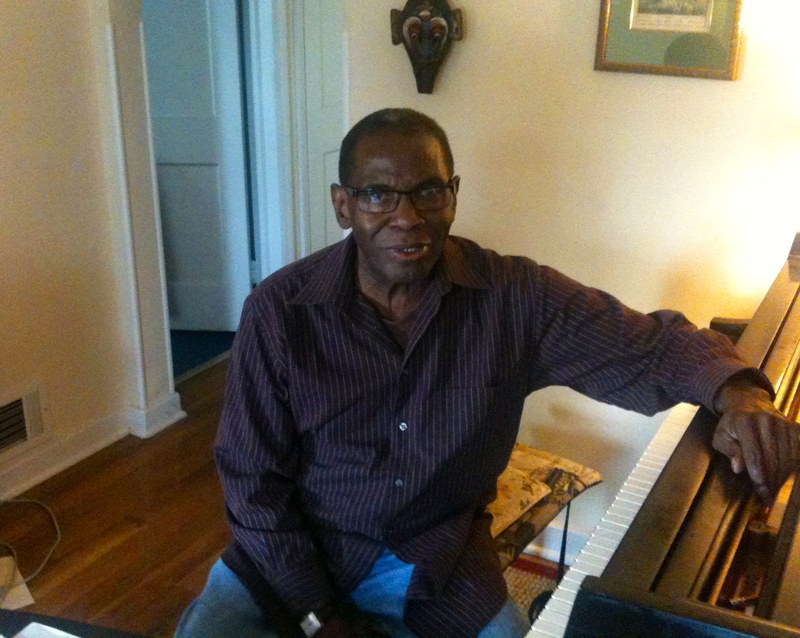 I learned a lot in a very short time at the Stanford Jazz Workshop two years ago when George sat in with Reid Anderson and Dave King for a swinging version of “Alone Together.” At his house after the interview he played a bit as well. The following is general discussion, the second part is a look through his whole discography. Thanks to Martin Porter for transcribing the interview. 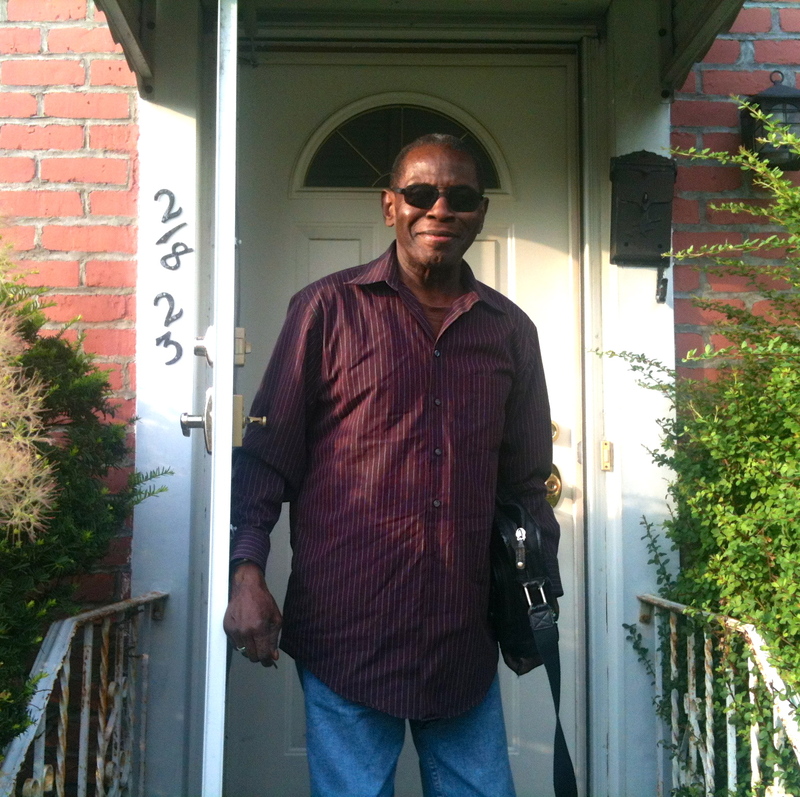 George Cables: I was born in Brooklyn, NY, in the Brooklyn hospital on November 14, 1944, the first half of the last century! The first nine years were in Brooklyn: the first seven years were on Gates Avenue between Franklin and Classon Avenues, and then the next few years on Chauncey Street between Ralph and Howard, and then we moved to St. Albans, where we were through my high school years. I took a year off, and then I went to Mannes College of Music, although I left after two years. I had gotten too interested in jazz. I started playing piano when I was about six or so. Before then, actually, I used to watch my mother play in the house, and I used to try to reach up to the piano to play. The music that I’m involved with now, jazz, was not in my vocabulary, it wasn’t in the house. I remember people I played with saying, “Yeah, man when I was a kid I used to listen to my Grandma, my father’s records. I was listening to Bird when I was 8, or 13, or something.” But all this stuff was new to me when I was 15 or 17 years old, so I was playing catch-up a lot of the time. Ethan Iverson: But you have such good technique, I have a feeling you must have gotten pretty far in classical studies. GC: Oh, yeah, I was playing classical music for a while. I went to a High School of Performing Arts and studied there, of course you had to have a private teacher, and then I went to Mannes College of Music as a piano major. But I was just starting to dabble and get familiar with the music. When I was 18, I used to go to the Five Spot, because in New York, the legal age was 18. I was able to go see Thelonious Monk and Charles Mingus and people like that. I used to watch people like Coleman Hawkins come in—with his big beard! I saw Trane at age 20 at Birdland, with Elvin and McCoy Tyner and Jimmy Garrison, what a band. But I was really still too young to really get the most out of that music, I was too young musically, not musically initiated enough to really get it. I heard some things where I was really moved, but I didn’t really know and understand in my heart and in my soul exactly. I didn’t understand in a deep way what was going on. I got some of things, as much as I could at the time. I got to Trane a little later on. That was when I was listening to some music in the basement and I was on the phone. I had A Love Supreme on—it was like something that was pounding on the door, you know, pounding on my brain’s door, “Let me in!” I got so distracted, I couldn’t talk on the phone, I had to hang up. All of a sudden, it was this epiphany, this realization, boom: “Oh, I get it.” You hear the stuff before, and you kind of like it, but everything else is kind of on the surface for me. I’m getting ahead of myself. My introduction to Thelonious Monk was in high school. A friend of mine played the tuba and turned me on to the Town Hall Concert that Hall Overton had arranged. Of course, he was all taken not only by the music, but also because there was a tuba! And he knew about Ray Draper, you know, who was probably one of the very few jazz tuba players for someone who had a reputation. Draper was not on that particular record, but there was another tuba player on the record. Hall Overton was a Monk spokesperson, a Thelonious Monk lover and expert, a powerful Thelonious Monk aficionado, who would do concerts, I mean you’d see stuff on the television where Thelonious Monk was in the Museum of Modern Art garden, and Hall Overton would be explaining to the audience about what Thelonious does, you know. His excitement and his love of Thelonious’ music could be infections, so that was nice. It was an introduction, a part of getting to know what Thelonious Monk was about. EI: So who did you find to play with when you were trying to play music? GC: One of them was Billy Cobham, and later on there was another guy named Bernard Scavella, and Leroy Martin, Jr., whose father was the first black 802 official, and helped us get into the union. EI: So it was you, Billy Cobham, and Clint Houston. What year was this? We met Lenny at a Jazz Interactions competition, you know, it was great, and we also kind of met up with Steve Grossman, who was part of that, as was Dave Liebman. And Dave, his mother and my mother, I think they were both teachers, they were both involved with the Board of Education. I remember we we had jam sessions here in the basement. EI: In this very house? GC: Yeah, because I moved out, and came back… Well, I’ll tell you about that. Dave came over, and my mom said, “Hey, this is Dave Liebman, I think I know his mother!” So that was a heck of a link. The Jazz Interactions competition brought a lot of us together. Larry Coryell was one of these people who had just come to New York, and he was one of these people. Anyway, The Jazz Samaritans was lead by Artie Simmons. He played drums and trombone, and his cousin was Roy Haynes who would come by and check us out, especially if Billy was playing, he wanted to check out Billy Cobham. He would also sit in, play the drums. I mean, I wasn’t really playing anything, I was just starting, didn’t really know anything, but he would come and thrill us. I remember Roy Haynes did a roll on the bass drum, and everybody just fell out! [Laughs] He took a solo on the bass drum, we couldn’t believe it, we don’t know anyone’s foot was that fast! I thought it was just great. And later I got to play with him, which was even better! But, you know, since I’m thinking about it, once I was playing with him, and I was enamored at that time with the rhythm section Miles had with Herbie, Ron, and Tony, you know, they used to catch each other and play across the bar, play these accents. So I thought, you know, since Roy, when he would accent, it wasn’t like he would always come down on “one,” or the “and of four.” But I would try to catch him, but it was trying to chase him around the block, you never could pin him down! I wanted to be playing out against the stuff with them, you know, but Joe would play up and play up on top of the chords, he’d play a vertical thing, so… That kind of helped to rein me in a little bit, you know. I could play my role, and sometimes I could go out, when it was time. EI: So how did you learn those chords in the first place, in the Sixties, when you were trying learn how to play? EI: I don’t know what that means! What does that mean? GC: “Oh man, I’m really playing jazz now!” [laughs] So maybe that’s what they meant when they said that Miles played off the fifth. Instead of playing 1-3-5, you played higher. EI: I remember the first time I learned the “So What” chord. GC: Yes. “WOOOOOOW!” Ha. Yeah. You got those, you don’t play the third, you play the fourth. “Huh, four, four chords, fourth chords! Fourth chords, OK…” and then you had the John Mehegan book, which was very popular too. GC: I didn’t really go through it, but people were talking about the A and the B voicings so that’s about as far as I got, I scanned what I thought I needed, what I was looking for. “OK, you can use that fourth voicing with a D in the bass, or you can make it a B-flat maj9, or a 6/9, or you could use it for other things.” And so you notice that you’re playing partials. You start playing the root position, but then you realize for minor, it’s not like playing a root with a major, it’s not being root-bound so much. And then the dominant chord, that gets ultra consonant with just the 1-3-5-7. Then you have to figure out what are you going to play with your right hand. John Mehegan said—as I remember—it was like a Bill Evans kind of thing, I mean, that was what we related it to, anyway. We would play the solo in the right hand, and these voicings for the left hand. And then you learn, OK, sometime less is more, sometimes you need to voice strategically, so you know, you can’t double what you have completely in both hands, that doesn’t work at all. I was looking for kind of a sound, kind of a direction. When you’re talking about upper partials, you don’t have to play just that voicing. It’s not written in stone: you can take stuff away so you get different sounds. That’s what you’re looking for. I always felt that Miles and Herbie were playing with colors rather than chords. I would hear these sound colors, and not hear the chord so much. So when the record My Funny Valentine came out, the one at Carnegie Hall, you heard these colors. Herbie was excellent at that, he’d put his hands on the piano, he had great touch, a great way of touching the piano, and found these great voicings, and played them as colors. And Bill Evans was kind of like that, but I was listening to Herbie, and to me, Herbie grooved more, and I liked his colors more. Bill Evans had something else going on that I got from him, but Herbie was somebody I thought was more accessible to me, or somebody who I could relate to, because he was a little more soulful. To me, he swung more. But I really enjoy Bill Evans’s solo playing, like when he plays “Danny Boy,” I love that. EI: Ok, so compare Herbie and McCoy. GC: Well, those were my two different schools. Basically, one gave you the sense of being more horizontal, and one gave you the sense of being more vertical. McCoy’s left hand was quite strong, and while both of them used the piano to comp where the piano was a percussion instrument, you were more aware of that with McCoy. That was right in your face with McCoy, because of the kind of music he was playing. McCoy was playing with Elvin for chrissakes, so he’s playing the piano more like a drum, and the left hand was very strong. His right hand was very strong, and McCoy is very soulful too, but you felt as if he was playing percussively, not that he was banging, but his was a percussive approach that the piano was a percussion instrument like the vibes, or an African xylophone. I mean Herbie’s voicings, I don’t know! Sometimes I asked Herbie, “What are you playing?” He said, “I don’t know.” Just put the piano in front of you, and where your hands fall, your hands fall. What he played was, I think, harmonically complicated. McCoy, you know, you got the sense that McCoy could kind of manhandle this thing. The feeling from McCoy… I remember one night at Keystone Korner in particular, I would have sworn that that piano was being levitated, he played with so much energy, it would just pick you up. You might hear him at Slug’s in New York, I loved hearing him there. There are some places that have a vibe that is very immediate, where the music just gets right to you. Slug’s was one of those places at that time, and the Keystone Korner was one of those places as well. It had a great vibe, just a great place to hear music, it just jumped right out at you. But I don’t know, you hear Herbie one day and say, “Well, that’s my favorite guy,” and you hear McCoy the next day and say, “Ooh, that’s my guy.” So those were the two guys, and I think they covered different areas. EI: Was Chick Corea in there? GC: Yes, Chick was another one of my faves. He was kind of behind them, and I remember when he sounded a little like Wynton Kelly, maybe before that, a little Horace, but I think a little Wynton sound, and then Herbie, and then McCoy, but then Chick, you know, you could really hear that coming, you could hear step by step. Chick had his own voice, and it was relatively early. I really like the way Chick plays drums as well, I think that some of that comes from that. He’s melodic, and he’s got a great melodic sense, and his own sound, his own concept, his own way of playing, the way he touches the piano. And he’s a great writer, the way he writes, you know, in a certain style. He’s written a lot of different things. But Roy Haynes had two weeks at Slug’s. The first week was Chick Corea, Scotty Holt, and Joe Henderson, and the second week was McCoy Tyner, Ron Carter, and Wayne Shorter. EI: Really! What year was that? GC: Oh, I don’t know, the Sixties. And Chick was just getting in there! [laughs] I remember, there were nights—the only night I ever had to leave early, because I was just full. There was so much stuff happening that I just—it wasn’t that I didn’t want it, I just couldn’t handle it, I couldn’t digest anymore, I had to go! And McCoy, you know. It was great to see the contrast. Those were two of the best weeks of music I’ve ever seen in my life. That and the music that was being made and how it hit you, what it did for me and to me, for me. And there were other weeks that I used to go listen to Thelonious Monk. It was brand new, it was such a discovery. It wasn’t just listening to the music, it was watching the music being made, watching him get up, dance, do his thing with Charlie Rouse, Butch Warren, and Frankie Dunlop. And then going to go see Charlie Mingus, the first time I went, Dolphy was playing with him, and Lonnie Hillyer, Charles McPherson, and of course Jaki Byard, who every now and then would reach down and pick up his alto and play! And Dannie Richmond. Watching what they did, it was the only band that I ever heard that would speed up the tempo gradually and then slow it down gradually. That was a really exciting band. In those days, you had a gig for a while, so you could get your music together, you know, play it a while, try it out, go back, this doesn’t work, that works, let’s get into this further, you know. There were so many things, watching Coleman Hawkins coming to play at the Five Spot, seeing Art Blakey—this was a little bit later—with Keith Jarrett. Then John Hicks was with Art Blakey at the Five Spot, John Hicks with Roy Haynes at the Five Spot. EI: Let’s talk about those two cats, Keith and Hicks. GC: The first time I ever saw Keith Jarrett was at the Vanguard when someone, Roland Kirk maybe was MC, and he was running the Monday night jam sessions, and Allen Grant was a DJ for ABC radio at the time, and he used to broadcast from the Half Note, and he was the big host of this jam session at the Vanguard, but Roland Kirk would be there to MC and run the thing, introduce the musicians. We came in as a group, the Jazz Samaritans, you know, I think Billy might have been part of that band at that time, Billy Cobham, I don’t think it was Lenny at the time. We went down there as a group. I didn’t have the nerve to play by myself, but there was a little more nerve with numbers, so we went as a group. We told Roland Kirk our names. He said, “OK, we’ve got this group, the Jazz Samaritans, and this is George Cables playing piano,” and so and so, and he reintroduced the group as we went off, remembered everybody’s names, and he’s not writing these names down! GC: And later, I saw he was working with Art Blakey, and I think some time after that he started working with Charles Lloyd, with Jack DeJohnette and Cecil McBee. Ron McClure played in that band as well, I don’t know when. So I remember seeing Keith on the New York scene, not a lot. I didn’t get to really speak and hang out with him. Or did he play with Miles first? EI: I think he played with Miles after he played with Charles Lloyd. GC: So I saw him playing with Miles and those guys, you know. But I don’t think he really got to where he wanted to be until a little later and started doing the solo concerts, you know. He liked to play some drums as well, he could play some drums. Now John Hicks, I got to know John pretty well. John was very nice, very gracious, very warm, and he liked to hang. So over the years we did that, and he played, he was gracious enough to play some of my music, and I got to play some of his music as well. But John was a very strong and energetic player, and a very warm player, very much part of the tradition, I think. Hearing him over the years, watching him, with Roy Haynes and Art Blakey, I thought at that time that he was influenced by McCoy, and I thought of that because of some of the intervals he used and some of the energy he had when playing with Art Blakey and Roy Haynes. 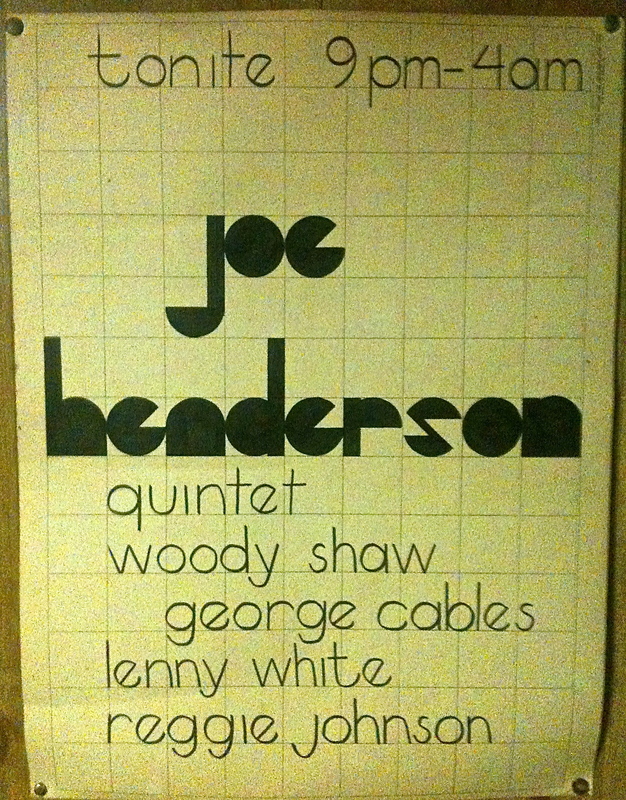 And also Bennie Maupin was there, and he put me in the mind of Joe Henderson, they seemed to be coming from similar places. Maybe not, but there was something about the concept that was similar at that time. EI: Tell me about some of your other early exposures to live and recorded music. GC: I remember getting the Dave Brubeck Time Out. I remember getting the Art Blakey Drums Suite record with “Our Calypso” and “Cubano Chant” on one side and Jackie Mac and Sam Dockery and Bill Hardman on the other. And then I fell in love with Wynton Kelly’s playing. When I was going to the High School of the Performing Arts, I would take the three-mile ride on the Q bus to the subway, then take the subway to Manhattan, and at the end of the day reverse. While we were waiting for the bus, sometimes we’d go in to this pizzeria, and they had Wynton Kelly’s “Little Tracy” on the juke box. It was a little calypso that he had written, and it was the only thing he had written on this MOR record Comin’ in the Back Door. It was a Verve record with Claus Ogerman arrangements of “Quiet Village” and some hits like that; I think it was an attempt to introduce Wynton Kelly, “the black pianist,” to a non-jazz audience. But Little Tracy, it was a little calypso. [sings melody] And he had West Indian roots, Wynton. So this calypso was so infectious, I used to play it every day. And he had a great feeling that was really bluesy, really soulful. And he could make anything swing. One of the things I really love of his is his intro on “Little Old Lady Passing By” on that Trane record [sings intro]. I just love the way he plays. That was Wynton Kelly. I never got to see him play, but I was certainly strongly affected by his music. Red seems to be the guy… I keep trying to say something, but then I think of an exception, thinking, “No, that can’t be it!” [laughs] Red would make it swing, and somehow, Wynton would let it swing. I think, but I’m sure I’m wrong, Red sometimes would attack the piano more than Wynton, although Wynton played hard. Although there’s an exception because of how Red plays “My Funny Valentine,” I really love that, it was really tender. EI: Did you listen to Horace Silver? GC: Not a whole lot. But he was an insistent guy. I love Horace, I didn’t spend as much time with Horace, but talking about those lefthand voices, he used them a lot! I really liked the fact that he could drive a band. He was a percussive pianist. He used the piano as a percussive instrument, and I love that. I try to tell students that the piano is a percussive instrument, and it can sing if you make it sing, and the whole orchestra’s in there, but you strike it, and that’s a quality, when you comp, I think you need to take advantage of. Some guys, you just hear the chords, a chord here, a chord there, but you need to invest in the rhythm, whether you’re delicate, it doesn’t mean you need to pound everything. You can try to drive and be an engine for a band, that’s part of what you do. The pianist, you know, we’re glue. We’re the glue of the rhythm section in a way, and maybe sometimes the glue in the band. EI: Let me drop a couple of other names on you, do you mind? GC: Oh, Hank Jones is very elegant. Again, I didn’t spend a lot of time with Hank, but when I listen to him I am impressed. He goes back a ways, he’s got a lot of history in his playing, and his left hand is very solid, I mean, he can play tenths and stuff. And I love his touch and the way he swings. He spans a lot of history, he is aware of a lot of different music, he’s not a pianist that has blinders on. He comes from way back, but he’s also aware of what’s up in front. GC: Oh, I love Cedar. He’s very deliberate, he also has a wide view of the piano. He’s sneaky, in a sense. You feel he’s very deliberate, and sometimes you can hear him thinking, hear where he’s going, but he has some things under his fingers, a lot of things in his head. I don’t know where I heard this, maybe it was an interview, but I heard him say that when he started playing, he wanted to be a good sideman, something to that effect. He wanted to be part of the band, and that resonates so much with me. That’s what I want. It was so important to me to be a good band member. There are some people who say, “I want to be the soloist, I want to be the guy in front.” Everyone likes the spotlight, but for that music to work, you need a team. And I got that from listening to Cedar with Art Blakey, Herbie with Miles, and McCoy with Trane. Sometimes people refer to the rhythm section as a backup band, and I think that nothing could be further from the truth, as long as a band member gives you freedom, has respect for you, and has the sense to let you be a part of it. Sometimes you get the impression that the soloist is the only person improvising. But everybody is improvising, and your role in that is to try to feed the soloist or work with the rhythm section to make it sound like a band to everybody so they can really be together. That’s playing music, that’s what you’re doing, you’re trying to make music. I would have just been thrilled to be part of a group that makes good music, really, in the end. And you know, that wish, I certainly got in spades.